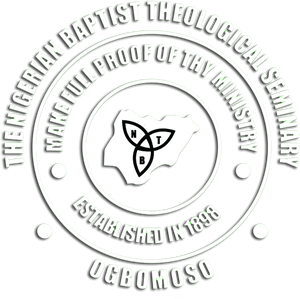 The Nigerian Baptist Theological Seminary, Ogbomoso was affiliated as a branch campus to the Southern Baptist Theological Seminary, Louisville, Kentucky, USA. The Southern Baptist Theological Seminary awarded the degrees at Ogbomoso from 1950 to 1997. In 1988 the Nigerian Baptist Theological Seminary was affiliated to the Religious Studies? Department of the University of Ibadan. All the postgraduate programmes of the Seminary other than the Doctor of Ministry were affiliated with the University of Jos from 2006 through 2012. In 1983, the Seminary was fully accredited by the Southern Association of Colleges and Schools (SACS) in the United States of America. Southern Association of Colleges and Schools is one of the six regional accrediting agencies recognized by the US government to accredit third level educational institutions. Thus, Nigerian Baptist Theological Seminary degrees were generally recognized anywhere in the world where American degrees were recognized. The Nigerian Baptist Theological Seminary received full accreditation in 2009 by the Accrediting Council for Theological Education in Africa (ACTEA) and Baptist Accrediting Council for Theological Schools in Nigeria (BACTSIN) in 2014. The Nigerian Baptist Theological Seminary has entered into a partnership relationship with Universities and Seminaries of the Baptist General Convention of Texas and the Texas Partnership Resource Centre, BGCT (TPRC). The partnership activities would benefit all the institutions and both Conventions as they seek to train men and women for Christian ministry. The following are the proposed partnership activities; Short-term Faculty Support, Student Participation, Faculty Development, Library Development and Technology. This partnership arrangement was formalized in April, 2005. In 2007, the first batch of three faculty members was at Mary Baylor University, Hardin-Simon University and W. Truetts Seminary for the staff exchange programme. The International Council for Higher Education (ICHE) is an international body pursuing excellence in academic programmes and promoting sustainable models of higher education. The Nigerian Baptist Theological Seminary became a member of the Council in October, 2004. The Overseas Council International is an international organization that facilitates professional development of faculty members of Christian institutions of higher learning. This council also enhances professional teaching skills of faculty members and provides communication structure for sharing professional development resources. Furthermore, it offers faculty development consultancy services. The Seminary became partnership institution of OCI in 2006. Baptist Center for Global Concerns, Arlington, Texas, USA. Baptist University College, Kumasi, Ghana. Trinity Theological Seminary, Legon, Accra. Akrofi-Christaller Center for Theology, Missions and Culture, Accra, Ghana. Bakke Graduate University, Seattle, Washington, USA. Trinity International University, Deerfield, Illinois, USA.